Invite your family, friends and neighbors to join us! See you at Anchors Conference Center on Monday, May 21st from 11:15 a.m. to 1:30 p.m. Cost is $16.00. (Pay the Chapter in the luncheon room: Cash or Check accepted) Enjoy a little fellowship, partake in a marvelous luncheon buffet with all the fixings, and learn a more about the Buffalo Soldier History. Anchors Conference Center & Catering is located at 2375 Recreational Way, Bldg 3210, San Diego, CA 92136 (National City) DIRECTIONS: The Anchors Catering and Conference Center is conveniently right off I-5 in San Diego on Main St. and the east side of Navy Base San Diego, 200 feet outside Gate 32, at Main St. and Yama St.
Monday, March 19th Invite your family, friends and neighbors to join us! See you at Anchors Conference Center on Monday, May 15th from 11:15 a.m. to 1:30 p.m. Cost is $16.00. (Pay the Chapter in the luncheon room: Cash or Check accepted) Enjoy a little fellowship, partake in a marvelous luncheon buffet with all the fixings, and learn a more about the San Diego Youth Leadership Conference. Although Julio DeGuzman was born in Malasiqui, Pangasinan, Republic of the Philippines, he grew up in San Diego during his elementary, junior high school and his high school years. He grew up playing baseball and joined the Cub Scouts and Boy Scouts. He also wre stled in high school. Julio majored in Criminal Justice and political science at SDSU. During his days at SDSU, he wrestled on the University Wrestling Team for which he received a wrestling scholarship, he was a member of the student council and was asked to join the Sigma Phi Epsilon fraternity and the OCEOTL Honorary Men’s Fraternity. He also worked part time at the San Diego County Probation Department. Upon graduation from SDSU, be became a Deputy Probation Officer and supervised a caseload of probationers. 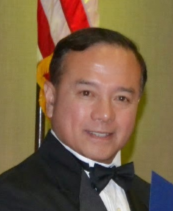 However, in 1982, Julio became the second Filipino American to become a Special Agent with the, at that time, called the Naval Investigative Service (now called the Naval Criminal Investigative Service). He worked many assignments in many offices and in 1984, he was transferred from Alameda, CA to the Philippines (US Embassy in Manila and Subic Bay in Olongapo City). He worked many undercover assignments to include, but not limited to, buying drugs from Americans undercover, buying stolen aircraft parts from the two US bases undercover, looking for Americans and Filipinos who were spying for the Soviet Union, searching for American fugitives who abscond to the Philippines to avoid prosecution and several other counterintelligence and counterterrorism operations. In 1986, Julio was transferred to the San Diego Regional Fraud Unit to investigate fraud against the government, white collar crimes, kickbacks, bribery and other fraud crimes. One of his big cases was in the late 1980s when he went under cover and infiltrated the so-called “Filipino mafia” whose members were accepting bribes in exchange for lucrative government contracts. In 1994, Julio got a promotion and transferred to the US Department of Defense Office of Inspector General to investigate DOD fraud and DOD contractors. He took on a new criminal area called medical fraud where he investigated physicians, chiropractors, medical clinics, blood labs, durable medical equipment representatives who were defrauding the government. There, Julio was the DOD special agent to open the very first criminal investigation in the Philippines targeting CHAMPUS/Tricare fraud. From 1996 to 2000, Julio traveled from town to town to town in the Philippines looking for US Navy veterans (who were US citizens of Filipino descent) suspected of defrauding CHAMPUS/Tricare by submitting inpatient hospital claims for hospitalization that never occurred. Julio was successful in locating and interviewing 27 US veterans and successfully prosecuting 21 of those in Madison, Wisconsin. In 2000 Julio was one of the runners up for the DOD special agent of the year because of his 22 indictments and 21 convictions. Julio secured almost a half million in criminal restitution. Julio retired from the government in 2006 as a GS-14 (equivalent to 0-5) and the day after his retirement he was offered a special investigator job by San Diego City Michael Aguirre. In 2009, then City Attorney Jan Goldsmith promoted Julio to be the Director of Community Relations for the office. Julio is now working in the criminal division as an investigator. Besides work, Julio is involved in his community: he is on the board of the La Jolla Town Council, president of the La Jolla Lions Club, president of the NCIS Retired Association Southwest Chapter, VP for Corporate Affairs for the US Army Association San Diego Chapter, former president of the All Hallows Catholic Academy Dad’s Club, former president of the Pangasinan Association of SD County, and a member of various boards of various associations and organizations. He is also a member of the Knights of Columbus. He and wife, Lisa, who is a intensive care unit nurse, have three kids: Marissa, who is a Customs and Border Protection Officer at the San Diego Airport, Christopher who is a sophomore at Mesa JR college, and Jonathan who is at Stanford University in Palo Alto, CA. Monday, September 25th Invite your family, friends and neighbors to join us! See you at Anchors Conference Center on Monday, September 25th from 11:15 a.m. to 1:30 p.m. Cost is $16.00. (Pay the Chapter in the luncheon room: Cash or Check accepted) Enjoy a little fellowship, partake in a marvelous luncheon buffet with all the fixings, and learn more about the United States Coast Guard Sector San Diego. LT Christopher J. Schleck hails from Caldwell, New Jersey and is a 2010 graduate of Rutgers University where he earned a degree in Bioenvironmental Engineering and a 2010 graduate of Coast Guard Officer Candidate School in New London, CT. In 2008, LT Schleck attended Coast Guard Basic Training in Cape May, NJ as part of the College Student Pre-Commissioning Initiative Program. He attended school full time while serving on active duty at Coast Guard Sector New York. From 2010-2013 LT Schleck served as a Prevention Officer specializing in US flagged commercial and passenger vessels. From 2013-2015, LT Schleck attended Naval Flight School in Pensacola Florida flying the Beechcraft T-6 Texan II and the TH-57 Jet Ranger alongside counterparts in the Navy and the Marines. 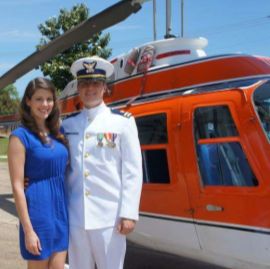 In 2015, LT Schleck graduated Flight School and was station in San Diego, CA to fly the MH-60T. In 2017, LT Schleck was recognized as a member of the 2017 San Diego Order of the Daedalians Aircrew of the Year along side Pilot CDR Pittman, Flight Mechanic AMT2 Jason Brenenstall, and rescue swimmer AST2 Chris Moore for the rescue of 3 sailors 206 miles of the Coast of San Diego. LT Schleck is married to his wife Catherine and has dogs, Brodie and Riley.